From individuals, small businesses to large corporation and with over 5 million downloads to date, Qlock is the most popular desktop clock available for Windows. Trading currency requires upto the minute tracking of multiple timezones throughout the day. Traders rely on Qlock because it gives them the current time and news for each timezone, fully custom desktop clock layouts and multiple, repeatable alarms for each currency. Keeping in touch with family and friends across the world is much easier with the Internet, its even easier now that Qlock can tell you the exact time for everyone you know. Keeping track of online game events, IRC chats and your friends gaming hours can get quite complicated. With Qlock you can see exactly what is happening across the world with one glance. You can set up alarms in each timezone to tell you when friends are going to be online or when the next big game starts. 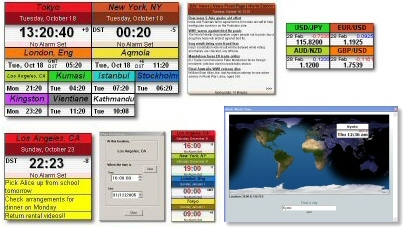 Studios use Qlock`s XXLarge skin mode so that engineers and producers can see the global time from anywhere in the room. For example, there is one well known US TV channel that uses Qlock on a wall mounted 42inch LCD display. Being in charge of multiple projects in multiple countries requires keeping track of those timezones. Qlock`s powerful Alarm feature allows you to set deadline, event and meeting notifications in each of those timezones. Designed for both business or home use, Qlock takes the world clock to a new level with more features, more settings and more control. Stay up to date with the latest times and news from around the world while you carry on working. Qlock fetches your most important news/stock/blog feeds and displays them in easy to read windows. More..
Get daily FX rates for all major currency pairs straight to your desktop. Set Strike prices for each pair to help you keep on top of the market. More.. These are a useful way of keeping track of to-do items, meetings, phone numbers or in fact anything that you would normally use a small sticky note for. If your monitor/desk is covered in those little things, then this feature is for you! More.. This feature is useful when you want to see other local times for any given time. For instance, if you have a meeting in Los Angeles at 4 pm and want to see what time it will be across the globe, just right click on Los Angeles, select "When the time is.." and set it to 16:00. All of the clocks will automatically display their local time and date for 4 pm in Los Angeles. As soon as you close the window, all of the clocks revert back to their normal time. More.. Create different Qlock layouts in each profile, switching instantly between profiles depending on what you are working on. This is great if you are a FOREX trader and need to see multiple times and feeds but also occaisonally more detailed information. More..
Qlock Sync allows you to synchronize your desktop settings across multiple PCs. For example if you have Qlock set up on your desktop at work and on a laptop, use Qlock Sync to keep both machine`s settings up to date with each other. Your entire layout, feeds, windows, settings, notes, user cities etc. will automatically transfer to our server so that you can keep your desktop upto date on the road, or where ever you are. More..
Qlock automatically downloads time zone and Daylight Saving Time changes, new features and bug fixes straight to your PC and updates itself automatically in the background, while you're doing other things. Qlock allows you to set up to 5 separate independent alarms per city window. For instance, you can have 3 alarms for New York, 2 for London and 1 for Tokyo. Creating a new alarm is simple and logical, just double click the alarm panel in the Qlock window, enable the alarm and set the time. After you confirm your settings, the Qlock window will continuously display the amount of time left until the next alarm. More..
As well as setting an absolute alarm time, you can also set a Countdown time. This will trigger the alarm after a certain period of time has passed and is useful for keeping track of events like meetings, lessons, telephone calls etc..
Qlock allows you change the transparency for each clock window. There are 3 transparency settings, Low, Medium and High that give you full control on how opaque the clock windows appear on your desktop. Screen real estate is valuable, it shouldn`t be wasted. With Qlock you can customize each and every clock window to suit your needs and tastes. From a single line for each time right up to the XXLarge quarter screen size. Qlock Gold's built-in world map allows you to see the time anywhere in the world simply by moving your mouse over a real-time night&day world map. Type in the name of a city and the map automatically searches and displays the time at that location, even before you've finished typing! More..